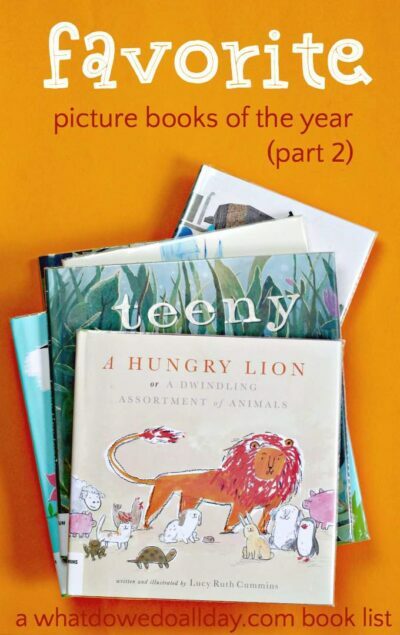 Time again to share with you some of our favorite picture books of the year. It’s still 2016, right? Ok. Good. Then it’s definitely time to reveal more of our favorite books of 2016. See part 1 of our list of favorite picture books of 2016 right here! A Hungry Lion, or A Dwindling Assortment of Animals by Lucy Ruth Cummins is for those of use who love a good dose of subversive humor. I don’t want to spoil the book because everyone needs a good, healthy gasp of surprise so instead I will set the stage for you. The lion is looking forward to a fun day with his adorable fuzzy friends. But they keep disappearing…. why? Will they return? Bloom by Doreen Cronin is a book after my 6 year old heart. (I sense a book list idea coming on.) Bloom is a mud fairy in a glass kingdom. When the glass kingdom becomes brittle, the royal family goes in search of a magical creature who can help them, but they scorn the mud fairy because she does not fit the mold of what they were expecting. Finally, a servant girl learns the secret of mud magic from Bloom and they work to save the kingdom. Wonderful and magical, with a dash of practicality. Teeny Tiny Toady by Jill Esbaum was definitely a favorite of my 7 year old. Teeny’s mama is scooped into a bucket and all the toad siblings try to figure how how to rescue them. The message of brain over brawn is a familiar one, but the delightful rhymes and Teeny’s winning personality make this a book to pick up and read over and over. It will put a big smile on your face. Wet Cement: A Mix of Concrete Poems by Bob Raczka. If you aren’t familiar with concrete poems, you are in for a real treat. I think they are my 11 year old’s favorite type of poetry because there is a puzzle factor and an “aha!” moment when what you are seeing connects with what you are thinking. This book is entirely in black and white and it is the poems themselves which create the pictures. A marvelous book. 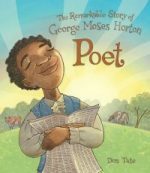 Poet: The Remarkable Story of George Moses Horton by Don Tate is indeed a remarkable and fascination historical biography of America’s first working African-American poet. I am glad to be able to share with my kids and I also learned a lot, myself! Horton was a slave in North Carolina. In the 19th century, he taught himself how to read, which was against the law. He sold produce at the market in order to make some money and when he started reciting his poetry, university students began to pay him to compose love poems so they could woo their sweethearts. He actually made enough money so that he could pay his master to be able to live in Chapel Hill—until the slaves were freed by the Emancipation Proclamation. Don’t miss this book. Hector and Hummingbird by Nicholas John Frith is a sweet book about friendship. Hector and Hummingbird are friends but lately Hector has been annoyed with how much noise Hummingbird makes! But when he finally gets what he wants, he misses his friend and learns that being left alone isn’t exactly what he wanted. The Bear and the Piano by David Litchfield is filled with wonderful illustrations. After a bear discovers a piano in the woods he becomes quite the virtuoso. A pair of children hear his music and convince the bear to go to the city and share his talent with the world. But bear worries about his fellow bear friends. Will they want him back when he returns or will they think he has abandoned him? The ending of this book will warm your heart and soul. Secret Tree Fort by Brianne Farley is a testament to the power of imagination. Big sister just wants to sit and read her book. (I can relate.) Yet, little sister wants to play. She describes an amazing fort, her descriptions getting more and more elaborate until finally her sister is tempted to put down her book. Tiger and Badger by Emily Jenkins. Tiger and Badger are best friends but that doesn’t stop them from getting into arguments, even over seemingly trivial things. (But remember, nothing is trivial to a child!) After every tiff, however, they are able to put things right, whether it be with working together to solve a problem, or with a silly face. This is one of the best books about friendship I have read and I urge you to pick up a copy! If you made it to the end of this post, you obviously love books and will want to make sure you get our weekly book list delivered straight to your inbox. We’ve enjoyed several of these, but I’m excited to check out the few we missed especially teeny tiny toad. Bloom has been one of our favorites. Love your lists as always. These books are great! Have you taken a look at the Sound of Silence by Katrina Grigg-Saito? My son loves it and the illustrations are beautiful. That’s on my to read list! I hope to have it from the library, soon!